+$Research shows which hues will chill you out. +$Finding the pace of modern life too much to handle? Feeling inundated by bad news on a daily basis? Don't worry, G.F Smith is here to help you unwind. 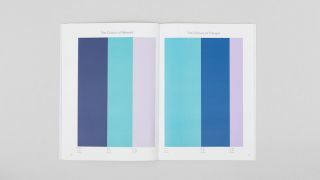 By conducting a study of over 26,000 people along with the University of Sussex, the paper manufacturer has managed to discover the world's most relaxing colour. Even just looking at it lowers the heart rate. Aaaah. +$The results of the research, which involved quizzing participants as to their emotional responses to specific colours, found that dark blue is the go-to hue if you're looking for some stress relief. +$While the survey doesn't specify a Pantone reference to help us match the colour exactly, it's definitely on the navy end of dark blue. Meanwhile, a mid-navy blue is said to be tranquil, rather than relaxing. Quite what the distinction between relaxing and tranquil is, we don't know. Maybe we'll have to run our own色彩理论+$survey to find out. +$These results have come off the back of G.F Smith's epic undertaking,+$The World's Favourite Colour Project+$. Other insights from the survey include the discovery that humans associate the colour green with the future, oranges and purples are said to evoke a sense of luxury, while deep reds and hot pinks are the shades of passion. +$"Colour has always had an intrinsic relationship with our culture and is woven into our consciousness," says G.F Smith’s joint managing director, John Haslam. "The story of colour maps a particular history through our cultural development – telling a much larger story about the way we perceive, value and cherish colour." +$"The study underlined that colour is as much about substance as it is about beauty. The fascinating results and their relevance are shared in the report – inspiring the world to think differently about the role and value of colour in our lives." +$So, branding designers, take note. If you want to instil a certain emotion in your customers, keep this colourful research in mind.